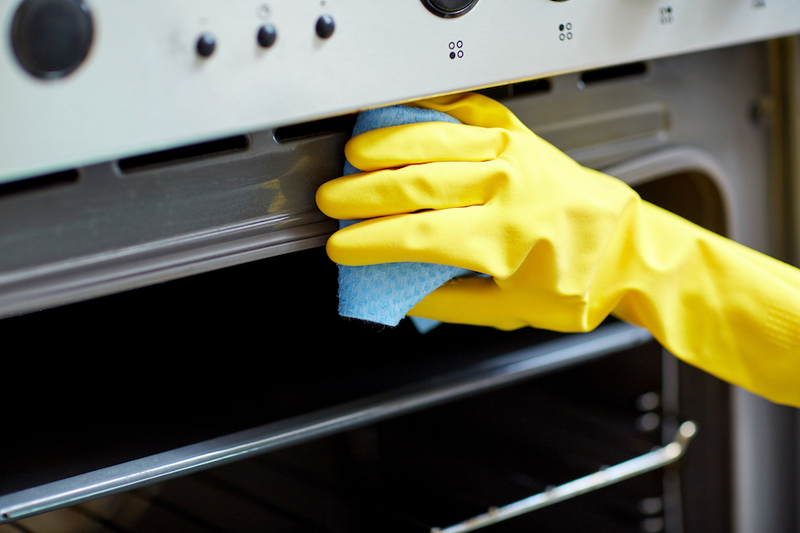 The cleaning of an oven usually involves harsh chemicals that create fumes and an unsafe environment for your family. Here I will show you a completely safe way to clean your oven with everyday products you likely have already in your home. All you need is a few items and a little elbow grease! I will list two options depending on the type of oven you have in your home. STEP TWO: Remove the oven racks and any other objects you have inside the oven. Set them aside. Place oven racks in the sink with warm water and a few drops of dish soap to soak. Vinegar and hot water can also be used as a soaking solution. STEP THREE: Turn on the oven’s self cleaning mode. The oven door should then lock. If the oven door does not lock, place tape over the door or use another barrier to make sure that family members will not be able to open the door. During a cleaning cycle the oven will reach between 800 and 900 degrees Fahrenheit. The cycle will turn any food and grease into gray ash. STEP FOUR: Wait at least two hours after the oven’s self cleaning cycle has finished in order to let the oven cool down. Once it has cooled completely, sweep any ash out of the oven with a small brush and dust pan. Next use a damp cloth to wipe the oven clean. You can use a vinegar and water solution to dampen the cloth. If the oven is extra dirty you may need to continue reading and scrub the oven with the solutions below under “Non Self Cleaning Oven”. If the oven is now clean, continue. STEP FIVE: After you have let the oven racks soak, scrub any extra food or grease off of each rack with a sponge. Rinse the racks and dry them with a clean towel. Then place them back inside the oven. STEP SIX: Clean the seals of the oven as well as the exterior oven door with a gentle cloth and hydrogen peroxide. This can also be done periodically to keep the door clean. And that’s it! STEP ONE: Remove the oven racks and any other objects you have inside the oven. Set them aside. Place oven racks in the sink with warm water and a few drops of dish soap to soak. Vinegar and hot water can also be used as a soaking solution. STEP THREE: Make a baking soda paste. Mix ½ cup of baking soda with a few tablespoons of water in a bowl. Usually 3 or 4 tablespoons of water makes a great spreadable paste. STEP FOUR: Use a sponge to spread the baking soda paste over the interior surfaces of your oven. Make sure to be aware of heating elements. This would be a great time to put on those rubber gloves in case your oven is full of grease and grime. The baking soda paste may turn a brownish color which is perfectly okay. Make sure to get all the nooks and crannies. STEP FIVE: Let the paste sit in the oven overnight or approximately 12 hours. STEP SIX: Use a damp gentle cloth and wipe out the oven. You may need to use a plastic or silicone spatula with a little bit of elbow grease for those hard area. STEP SEVEN: Now fill a spray bottle with vinegar and spray the areas you still see baking soda. This will create a reaction and the baking soda will foam, making it easier to remove. STEP SEVEN: Do a final wipe down, removing the last bit of foam and solution from your oven. Use a clean damp cloth and possibly more vinegar to make the surfaces shiny. STEP EIGHT: Place the clean oven racks back inside the oven.